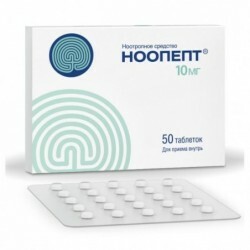 Encephabol is a nootropic drug. 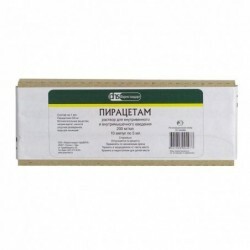 Pyritinol increases pathologically reduced metabolism in the brain by increasing the uptake and utilization of glucose, increases the metabolism of nucleic acids and the release of acetylcholine in the synapses of nerve cells, improves cholinergic transmission between cells of the nervous tissue. It contributes to the stabilization of the cell membrane structure of nerve cells and their function by inhibiting lysosome enzymes, thereby preventing the formation of free radicals. 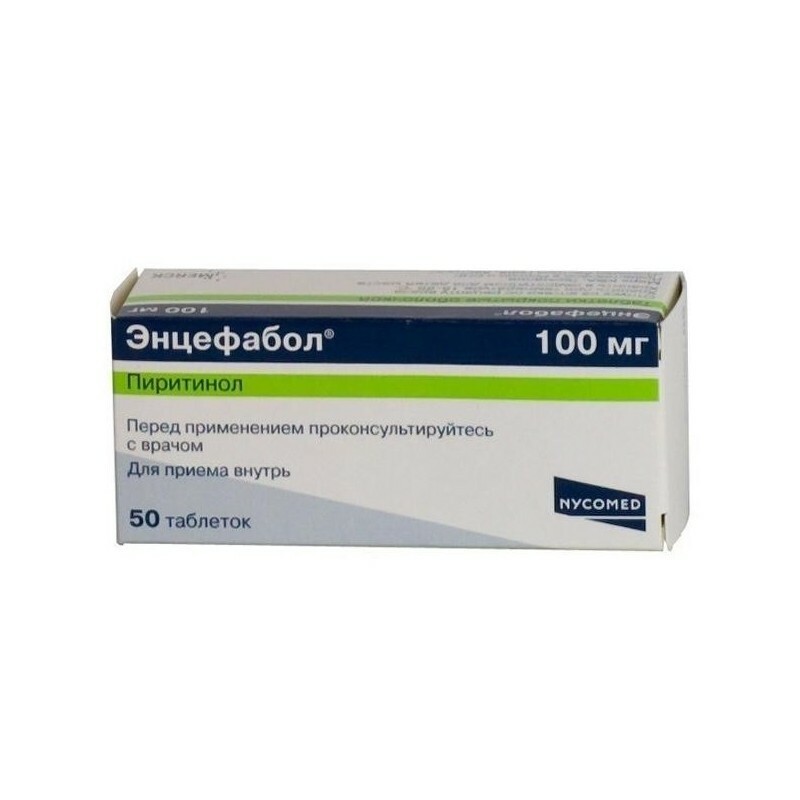 Pyritinol improves the rheological properties of blood, increases the plasticity of red blood cells by increasing the content of ATP in their membrane, which leads to a decrease in blood viscosity and improve blood flow. Pyritinol, by improving blood circulation in ischemic brain regions, increases their oxygen supply; increases glucose metabolism. As a result, memory performance is improved and impaired metabolic processes in the nervous tissue are restored, which contributes to the full functioning of its cells. Pyritinol is rapidly absorbed when taken orally. Bioavailability averages 85% (76-93%). 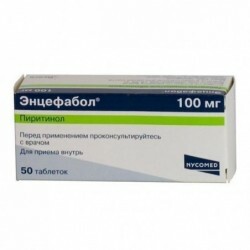 The maximum plasma concentration is reached within 30-60 minutes after ingestion of 100 mg pyritinol. The half-life is about 2.5 hours. Pyritinol metabolizes rapidly. 20-40% of the substance is reversibly bound to plasma proteins. The following substances have been identified as the main metabolites: 2-methyl-3-hydroxy-4-hydroxymethyl-5-methyl mercaptomethyl pyridine and 2-methyl-3-hydroxy-4-hydroxymethyl-5 methyl methyl sulfinylmethyl pyridine. Conjugated metabolites are excreted primarily through the kidneys. The total urinary excretion within 24 hours is 72.4-74.2%. Most of the dose received is excreted during the first 4 hours after administration. With faeces only 5% of the dose is excreted. When re-oral appointment cumulation is not observed. Toxic concentrations do not develop even with impaired renal function. Penetrates through the blood-brain barrier, metabolites accumulate mainly in the gray matter of the brain. Pyritinol crosses the placental barrier. Studies have not revealed teratogenic or embryotoxic activity. Symptomatic treatment of chronic disorders of brain function in dementia syndromes with the following leading symptoms: impaired memory, concentration ability and thinking, fatigue, lack of motivation and motivation, affective disorders. Symptomatic therapy of chronic impairment of mental performance. Mental retardation, cerebrastenic syndrome, encephalopathy in children. active substance: pyritinol 100 mg.
Excipients: sodium carmellose 7000, magnesium stearate, colloidal silicon dioxide, sodium carboxystarch, lactose monohydrate, powdered cellulose. shell composition: choline yellow dye 70%, mountain glycolic wax, gelatin, acacia gum, wheat flour, titanium dioxide, kaolin, talc (magnesium hydrosilicate), sucrose. Inside, 2 times a day, regardless of the meal. Treatment of acute and chronic psychosis, including schizophrenia: The daily dose in the first 4 days is: 1st day - 50 mg; 2nd day - 200 mg; 3rd day - 200 mg and 4th day - 300 mg. 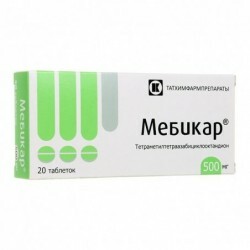 Starting from the fourth day, the daily dose is recommended: 300 mg. Depending on the clinical effect and tolerability of the drug, its dose may individually vary from 150 mg / day to 750 mg / day. 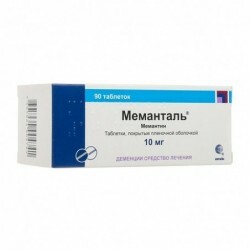 The maximum daily dose for the treatment of schizophrenia is 750 mg. Treatment of manic episodes in bipolar disorder: Quetiapine is recommended as monotherapy or as adjuvant therapy to stabilize mood. The daily dose in the first 4 days is: 1st day - 100 mg; 2nd day 200mg; 3rd day - 300 mg and 4th day - 400 mg. The increase in the daily dose in the future may be 200 mg per day and by the 6th day of therapy is 800 mg. Depending on the clinical effect and tolerability of the drug, its dose may individually vary from 200 mg / day to 800 mg / day. As a rule, the effective dose ranges from 400 to 800 mg / day. The maximum daily dose for this indication is 800 mg. Since plasma clearance of quetiapine in elderly people is reduced by 30-50%, the drug should be prescribed with caution, especially at the beginning of therapy. The starting dose is 25 mg / day, followed by an increase of 25-50 mg to achieve an effective dose. Kidney and liver failure: In patients with renal and hepatic insufficiency, it is recommended to begin therapy with 25 mg / day. In the future, it is recommended to increase the dose daily by 25-50 mg to achieve an effective dose. From the side of blood-forming organs and lymphatic system: often - leukopenia; infrequently - eosinophilia; very rarely - neutropenia. Metabolism and nutrition disorders: often - weight gain (mainly in the first weeks of treatment); very rarely - hyperglycemia or decompensation of diabetes. From the central and peripheral nervous system: very often - dizziness, drowsiness, headache; often syncopal states; infrequently - anxiety, agitation, insomnia, akathisia, tremor, convulsions, depression, paresthesias; very rare: tardive dyskinesia. Since the cardiovascular system: often - tachycardia, orthostatic hypotension, prolongation of the QT interval on the ECG. On the part of the respiratory system: rhinitis, pharyngitis. From the gastrointestinal tract: often - dry mouth, constipation, diarrhea, dyspepsia; rarely - jaundice, nausea, vomiting, abdominal pain; very rarely - hepatitis. Allergic reactions: infrequently - skin rash, hypersensitivity reactions; very rarely - angioedema, Stevens-Johnson syndrome. From the reproductive system and mammary glands: rarely, priapism (painful erection). Other: often - peripheral edema, asthenia; rarely - lower back pain, chest pain, subfebrile condition, myalgia, dry skin, impaired vision, neuroleptic malignant syndrome (hyperthermia, impaired consciousness, muscle rigidity, vegetative - vascular disorders, an increase in the concentration of creatine phosphokinase). Laboratory indicators: often - increased levels of serum transaminases (ACT or ALT); infrequently - an increase in the serum level of GGT and the content of triglycerides (not fasting), hypercholesterolemia; a decrease in the level of thyroid hormones: total T4 and free T4 (in the first 4 weeks), as well as total TK and reversible TK (only when taking high doses of Quetiapine). Carefully: patients with cardiovascular and cerebrovascular diseases or other conditions predisposing to arterial hypotension, a congenital increase in the QT interval on an electrocardiogram (ECG) or in the presence of conditions that can potentially cause an increase in the QT interval (simultaneous administration of drugs that prolong the QT interval, congestive heart failure, hypocaloria hypomagnesemia), old age, liver failure, epilepsy, history of convulsive seizures, pregnancy. Quetiapine does not cause induction of liver enzyme systems involved in the metabolism of phenazone and lithium. The simultaneous administration of quetiapine with drugs that potentially inhibit liver enzymes, such as carbamazepine or phenytoin, as well as with barbiturates, rifampicin, may decrease the plasma concentrations of quetiapine, which may require an increase in Quentiax dose, depending on the clinical effect. This also needs to be considered when canceling phenytoin or carbamazepine, or another inducer of the liver enzyme system, or replacing it with a drug that does not induce microsomal liver enzymes (for example, valproic acid). The main enzyme responsible for the metabolism of quetiapine cytochrome P450 is CYP3A4. The pharmacokinetics of quetiapine does not change with the simultaneous use of both simitidine (P450 inhibitor) or fluoxetine (CYP3A4 inhibitor and CYP2D6 inhibitor), imipramine antidepressant (CYP2D6 inhibitor). It is recommended to use caution with the simultaneous use of quetiapine and the systemic use of CYP3A4 inhibitors (antifungal agents of the azoles group and macrolide antibiotics), since Quetiapine plasma concentrations may increase. Therefore, lower doses of quetiapine should be used. Special attention should be paid to elderly and debilitated patients. The pharmacokinetics of quetiapine did not change significantly with simultaneous administration with antipsychotics - risperidone or haloperidone. However, simultaneous taking of quetiapine with thioridazine led to an increase in clearance of quetiapine. Drugs that depress the central nervous system (CNS) and ethanol increase the risk of side effects. Safety and efficacy of quetiapine in pregnant women have not been established. Therefore, during pregnancy, quetiapine can only be used if the expected benefit justifies the potential risk. The degree of excretion of quetiapine with mother's milk has not been established. Women should be advised to avoid breastfeeding while taking quetiapine. With abrupt cancellation of high doses of antipsychotic drugs, the following acute reactions (“withdrawal syndrome”) may occur - nausea, vomiting, rarely insomnia. Cases have been reported. exacerbations of psychotic symptoms and the appearance of involuntary movement disorders (akathisia, dystonia, dyskinesia). 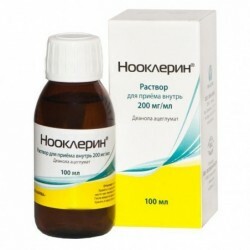 In this connection, it is recommended to discontinue the drug gradually. When prescribing quetiapine simultaneously with drugs that prolong the QT interval, care must be taken, especially in the elderly. With congestive heart failure, with hypokalemia and hypomagnesaemia. Given that quetiapine affects the central nervous system, the drug should be used with caution in combination with other drugs that have a depressant effect on the central nervous system. It is recommended to abstain from alcohol. If symptoms of tardive dyskinesia appear, reduce the dose or stop using quetiapine. In controlled clinical trials, there was no difference in the incidence of seizures between quetiapine and placebo. However, just as with other antipsychotic medications, caution is advised when treating patients with a history of convulsive seizures. Malignant neuroleptic syndrome may be associated with ongoing antipsychotic medication. Clinical manifestations of the syndrome include: hyperthermia, altered mental status, muscular rigidity, instability of the autonomic nervous system, an increase in the level of creatine phosphokinase. With the development of this syndrome, quetiapine should be canceled and appropriate treatment carried out. Influence on the ability to drive a car and other mechanical means: during the period of quetiapine treatment, it is recommended to be careful when driving motor vehicles and engaging in other potentially hazardous activities that require increased concentration of attention and quickness of psychomotor reactions. Data on quetiapine overdose is limited. The cases of taking quetiapine in a dose exceeding 30 g have been described. In most patients, side effects were not observed, in cases of their development, side effects passed on their own. A fatal case has been reported with 13.6 grams of quetiapine. Extremely rare cases of quetiapine overdose have been reported, leading to prolongation of the QT interval, coma or death. In patients with a history of severe cardiovascular disease, the risk of side effects in overdose may increase. Symptoms: excessive sedation, drowsiness, tachycardia, lowering blood pressure. Treatment: symptomatic; measures aimed at maintaining respiratory function, cardiovascular system, adequate oxygenation and ventilation of the lungs. There are no specific antidotes.